When was the last time you sent a Christmas card? Was it a family photo, and hand-made project, or an E-Card? Some families I know send them every year (whether the photo they take is heart-felt and sincere or purposefully awkward is another story) while others choose not to take part in the age old tradition. Here are my three favorite homemade Christmas card ideas! 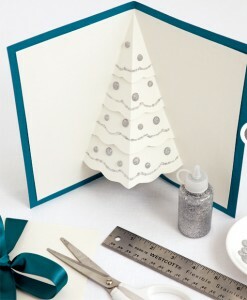 I love this card because it looks so fancy and complicated but is actually quite easy to make. Everyone loves a good pop-up book, and no one will be expecting your card to jump out at them like this! Using the fold of the white card stock as the center of the tree, with a pencil, draw half of a triangle, starting just a few millimeters from the top and ending about an inch from the bottom at a width of about 2″. Using the glue stick, mount this piece onto the blue card stock. Customize and decorate your tree however you like! Let everything dry before closing the card. Everyone, at some point in their life, has made a hand-turkey for Thanksgiving. Whether it was in preschool or just a few weeks ago on your office white board (No? Just me? 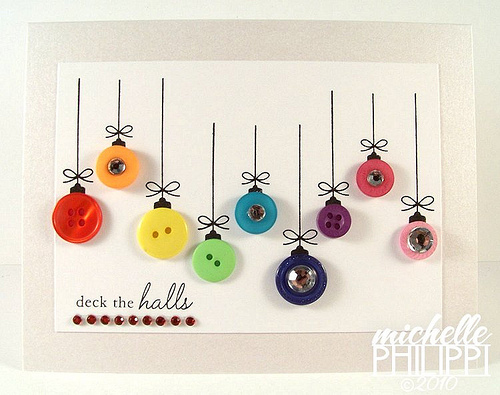 ), everyone knows this is by far the easiest and cutest holiday project for kids. 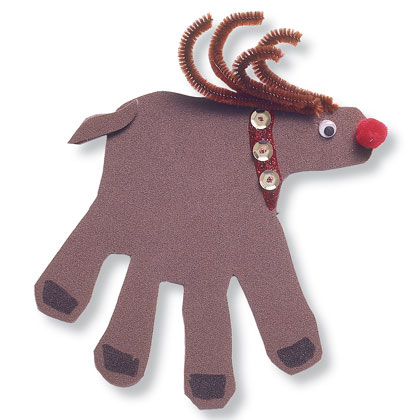 Now, instead of just Thanksgiving, you can break out your hand-art and make reindeer for Christmas! On one side of your folded paper, trace around your hand with your fingers spread. Make sure the crease is where your wrist is. Use your scissors to cut out your handprint. Unlike your Thanksgiving turkey, turn your handprint upside down. Your fingers will become the reindeer’s hooves and your thumb will be his head. Glue on a Googly eye and the red felt ball for his nose. Slightly bend a few pipe cleaners and glue them to the top of your reindeer’s head for antlers. Cut out a small piece of brown paper from your scrap pile to create his tail and color in his hooves and a harness. Finally, open up your card and write a heartfelt message on the palm of your handprint! This one is very chic and can look like you spent hours on it when in reality it usually takes less than 10 minutes to make. This super easy card will win you some major brownie points this season! Place a piece of cardboard or another piece of stock paper between the folds of your paper to keep the glue from bleeding through. Place your buttons at varying levels and glue them down. Wait for the glue to dry before continuing. Decorate your ‘baubles’ with any sequins, stickers, or patterns you like. Using your marker or pen, draw in the hanging ribbons for a festive curtain. Big thanks to Style At Home, Good Ideas and Tips, and Michelle Philippi for these great ideas. Do you send out holiday cards every year? If so, we’d love to see what ideas you’ve come up with as well! Leave a photo comment on our Facebook post. Happy crafting!